1) Using the skirt front foundation as a guide, draw slash line from bottom to side at hip as indicated, then slash and spread for extra sweep at bottom as shown in diagram 2. 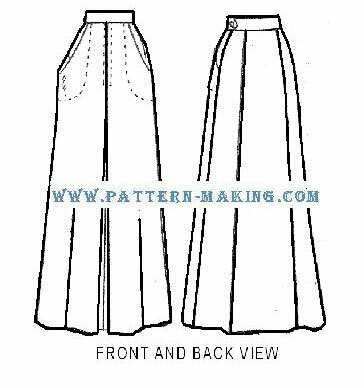 2) Draw diagonal line for pocket opening as indicated; then draw outline for inset and pocket on front of skirt. Trace each section separately as shown in diagram 3. 3) Draft the pocket facing, 2 . . .